Re-designation of 34th (Cumberland) Regiment of Foot, 1 July 1881. Amalgated with 2nd Border Regiment, 28 October 1950. 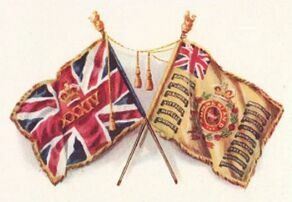 Border Regiment postings from formation to the First World War. Rugby, England (87 Brigade, 29 Division) 1915; Egypt 1915. Before the war broke out in Europe events were slowly unfolding that would spiral out of control and eventually lead to the assassination of Archduke Franz Ferdinand of Austria, which ultimately led to the Border Regiment’s involvement in the very early stages of the beginning of the war. During the summer of 1914, the 1st Border Regiment was stationed in Upper Burma at a place called Maymyo. The Battalion had been away from the familiar shores of home for a continuous period of no less than eight years, having been stationed in Gibraltar and India respectively since 1906. The time spent abroad on foreign service, as with every other battalion of its type, benefited from their training to the point of being at their finest in military efficiency and it was this effectiveness in their duties that saw the Battalion performing well under very difficult circumstances, even in such early stages of the war. The 1st Battalion was just one of many infantry battalions listed as part of the British garrison of India and Burma, a total of 52 in all; of these 49 were in India and the remaining three, of which the 1st Battalion was one, were in Burma along with 4th Battalion Worcestershire Regiment and 1st Battalion Royal Munster Fusiliers. The strength of the 1st Border Regiment's officers at this time, prior to Britain’s declaration of war against Germany in August 1914, was a total of 29, several of which were on leave. What was happening in Europe was now going to ultimately affect what was happening in India. For the first part of the voyage the transport ships were escorted by the Northbrook and the French cruiser Suffren; for the second part by the Eclispe. There were several ports of call along the way including Aden, Suez, Port Said and Malta and upon reaching Gibraltar, a five day stay was taken in so that further transports coming from China could be collected. It wasn’t until 10 January, 1915, that the Battalion reached the shores at Avonmouth where they continued their journey by train to Rugby. As they billeted it was here that they became part of the 87th Brigade of the 29th Division. The 1st Battalion, along side that of the 2nd Battalion South Wales Borderers, 1st Battalion King’s Own Scottish Borderers and the 1st Battalion Royal Irish Fusiliers formed the 87th Brigade, a number you will become familiar with reading this history. These Battalions will also play an important roll in the telling of this Battalion’s movements during the several theatres of war, operations and battles throughout the war in which they took part. For now the 1st Battalion’s history comes to a brief halt before continuing in March of the same year. The actions of the 1st Border Regiment during the war continues across Gallipoli, France and Belgium towards the Final Advance that ultimately leads to Victory. The aim of transcribing the war diary is to include as much of the original character as possible. This does include some incorrect spelling and infrequent punctuation to remain in keeping with our aims of the project. Each transcript includes a place, date, hour and summary column in a basic table format indicating the battalion, month and year in the title. Please note that the National Archives hold the copyright of the scanned images. However, transcripts of unpublished Crown Copyright war diaries from the First World War can be used in any type of media such as websites and books providing they conform to certain conditions. The National Archives state: "You are free to transcribe, translate, index and quote from published or unpublished Crown copyright material among the records as extensively as you wish and you may publish the results in any format and any medium: in accordance with the terms of the Open Government Licence." With this in mind each transcript will state: "The transcription above is available under the National Archives Open Government Licence for public sector information." For more information see the main war diary project page. The 1st Battalion World War One casualty list has been compiled using the publication Soldiers Died in the Great War 1914-19, Volume 39, The Border Regiment and cross-referenced with the Commonwealth War Graves Commission database. The number of casualties compiled to date does not necessarily reflect the total number of casualties for this battalion due to the possibility of missed names and the (current) exclusion of officers and other ranks that were attached to the Border Regiment. This listing is a work-in-progress. For the 1st Battalion roll of honour, see 1st Battalion Border Regiment Casualty List. ↑ Lt-Col. Robert Ousley Cuthbert Hume: 4 August 1914 - 1 May 1915 (killed in action/died of wounds). ↑ Lt-Col. Herbert Nelson: 8 May 1915 - 6 July 1915 (replaced). ↑ Lt-Col. Frank George Grier Morris: 7 July 1915 - 22 September 1915 (replaced). ↑ Lt-Col. Arthur Erskine St. Vincent Pollard: 22 September 1915 - 19 June 1916 (replaced). ↑ Lt-Col. Archibald Jenner Ellis: 20 June 1916 - 1 July 1916 (wounded). ↑ Major James Ross Meiklejohn: 1 July 1916 - 14 August 1916 (replaced). ↑ Lt-Col. Frank George Grier Morris: 14 August 1916 - 10 April 1917 (replaced). ↑ Lt-Col. Archibald Jenner Ellis: 11 April 1917 - 22 February 1918 (replaced). ↑ Lt-Col. James Forbes-Robertson: 22 February 1918 - 12 April 1918 (wounded). ↑ Lt-Col. Cyril Alexander George Octavius Murray: 12 April 1918 - 22 June 1918 (transferred to another battalion). ↑ Major Harold England Festing: 22 June 1918 - 1 July 1918 (replaced and then later between 26 July 1918 - 6 October 1918 (invalided). ↑ Lt-Col. Arthur Wendle Sutcliffe: 1 July 1918 - 26 July 1918 (replaced with his predecessor then was re-appointed and remained the Commanding Officer). ↑ Colonel H.C. Wylly, C.B. (1925). The Border Regiment in the Great War. Gale & Polden Ltd. ISBN 1847342728. p.17. This page was last edited on 23 March 2017, at 17:59.